Window Decal, made with high quality outdoor vinyl with up to 6 years durability. 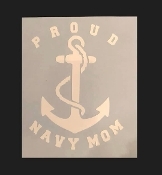 You choose Proud Navy Mom, Proud Navy Dad, Proud Navy Family. Approximately 5 X 4 inches. FREE SHIPPING. Message us for Special Orders.